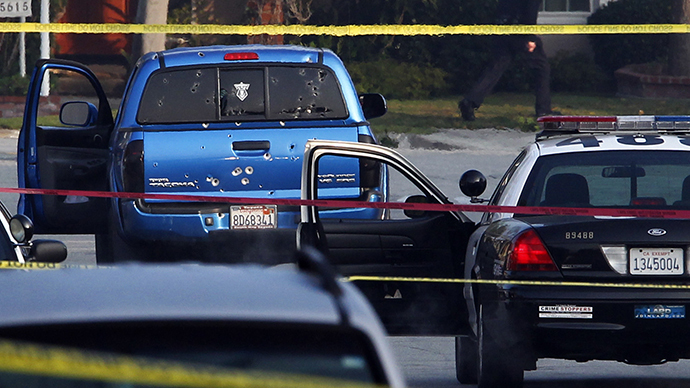 A civilian oversight board now says that eight police officers from the Los Angeles, California area violated departmental policy last year when they mistakenly opened fire on a pickup truck believed to belong to at-large suspect Christopher Dorner. 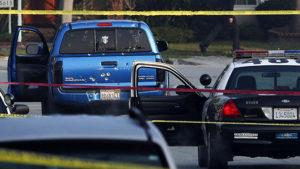 Two women were shot and injured in the town of Torrance, CA when their vehicle was erroneously assumed to be driven by Dorner, a 33-year-old ex-cop suspected of killing a police officer in cold blood only hours earlier in the nearby town of Riverside. The women were delivering newspapers just before dawn when their blue Toyota Tacoma was mistaken mid-route by police for the grey Nissan Titan that Dorner was spotted driving hours earlier. At a news conference on Tuesday this week, Chief Charlie Beck of the Los Angeles Police Department recalled that an officer confused the sound of a paper being thrown against the pavement with that of a gunshot, and opened fire on who he presumed to be the disgruntled former cop. Seven other officers then began shooting. By the time the smoke had cleared, the officers involved had fired more than 100 rounds at the women’s pickup truck. Emma Hernandez, 71, suffered two gunshot wounds to the back, and her daughter, 47-year-old Margie Carranza, was injured by auto glass shattered during the early morning encounter. At Tuesday’s conference, Beck said that the review board agreed that all eight officers acted improperly. “While I certainly empathize and understand the conditions and circumstances that led to this particular officer-involved shooting, I hold our police officers to the highest standards in the application of deadly force,” Beck told reporters. “As in all use-of-force incidents, the department has completed a thorough review and will adopt the lessons learned, both good and bad, from these incidents,” added Steve Soboroff, president of the Police Commission. According to the Associated Press, Soboroff said that both Beck and Alex Bustamante, the inspector general for the Los Angeles Police Commission, had independently recommended that the shooting be ruled out of policy. The LAPD and the City of Los Angeles agreed last year to compensate the women with $40,000 for a new truck, as well as a settlement worth a reported $4.2 million. Upon release of the review group’s findings, however, the officers involved may see that the serious consequences caused by the shooting don’t end there. Beck has declined to comment on what action the department will take against the eight cops found to have violated LAPD policies, but his options include ordering reprimands, suspensions or even the termination of those officers’ jobs. Glen Jonas, an attorney for one of the two victims involved, told the AP he wasn’t surprised by the review group’s findings. Authorities eventually narrowed in on Dorner, and on February 12 he died after his cabin hideout near a mountain resort burned to the ground. He had been charged with killing four people, including three police officers, starting Feb 3.